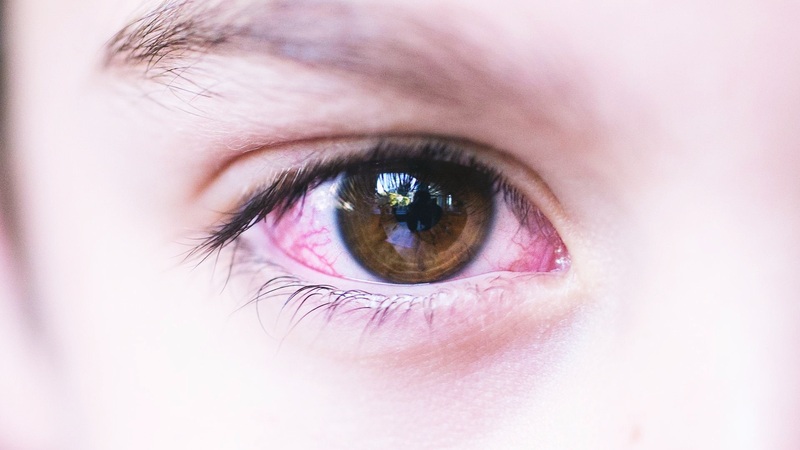 In this article we will be focusing primarily on the contagious nature of pink eye, analyzing how long pink eye is contagious for and how contagious it is. Before we begin our discussion of the causes, symptomatology, treatment, and other underlying details about pink eye, we first need to understand what pink eye is. You’ve probably heard about pink eye at some point in your life, most likely when you were younger. You might have even had to deal with the condition on more than one occasion. So, you might be curious what exactly pink eye is and what can cause it. Pink eye, or conjunctivitis, occurs when the conjunctiva, the transparent membrane of your eye, becomes inflamed or infected. However, before we can dive into understanding the pathology of pink eye, we need to first understand what the conjunctiva is and its role in the eye and vision. Please note that we will use the term “pink eye” in this article to refer to all types of conjunctivitis. However, pink eye actually means simply viral conjunctivitis to your eye doctor. The conjunctiva is a protective membrane that covers the surface of the eye and the inner surface of the eyelids. It is transparent and mucous-like in nature. 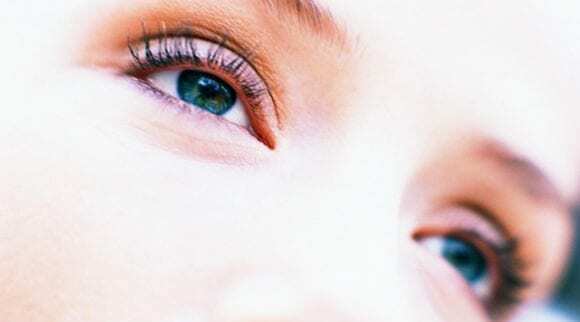 It is made up of two segments: the bulbar and palpebral conjunctiva. The bulbar conjunctiva covers the anterior, front portion of the sclera. It stops where the sclera and cornea meet each other, and it does not cover the cornea. The palpebral conjunctiva covers the inner portions of both eyelids on each eye. Because these two conjunctivae are continuous, it is impossible for anything to get caught behind your eye. It keeps the front of the eye, and inner surfaces of the eyelids, well lubricated, allowing the eye and eyelids to move with minimal friction and irritation. The conjunctiva also acts as a protective layer for the eye. Is pink eye contagious? Yes, the viral infection associated with pink eye can be easily passed between people. You might be asking, if the conjunctiva is a transparent membrane, then why does pink eye result in red, bloodshot eyes? Although the conjunctiva is transparent, as previously mentioned, this layer contains numerous blood vessels that overlay the sclera. Because these blood vessels are present, any source of inflammation will result in dilation of these blood vessels, leading to the presentation of red, bloodshot eyes. So, what can cause this inflammation? Pink eye is most commonly resultant of a bacterial or viral infection, but it can also occur from other causes. Although most people refer to all types of conjunctivitis as pink eye, most eye doctors use the term pink eye only referring to viral conjunctivitis. There are four main types of conjunctivitis, as listed below. 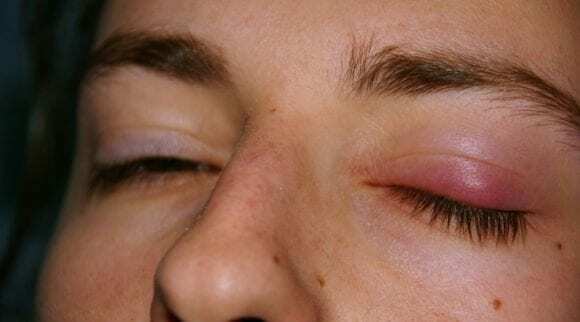 All of these different types of “pink eye” may be similar in terms of clinical presentation and symptomatology, however, they differ in the cause, how contagious pink eye is, and treatment. We will discuss the overarching symptomatology of each of these different types of conjunctivitis before digging into how contagious pink eye is based on the type you are dealing with. 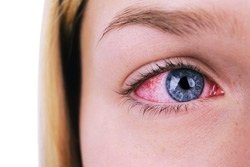 As the name of the condition implies, the primary symptom of pink eye is an eye, or both eyes, having a pink appearance. Depending on the level of irritation, inflammation, or infection, the affected eye(s) can also develop a red color. Although it is not as obvious visually, there is also an associated swelling of the conjunctiva, and this swelling may also affect the eyelids. You might also notice that you have increased tear production due to pink eye, which may also be worsened with an itchy sensation and urge to rub your eye(s). You may also experience irritation or a burning sensation in your eyes. If symptoms last long enough, and depending on the cause of conjunctivitis, you may also notice discharge, which can be either pus or mucus. 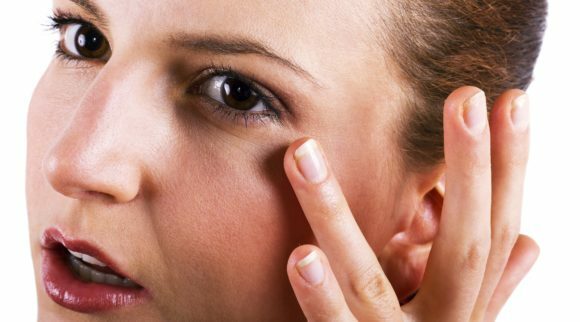 There may also be crusting in your eyelids or eyelashes, and you might experience discomfort if you use contact lenses. 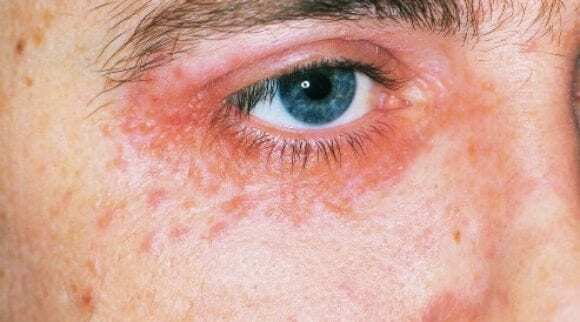 Viral Conjunctivitis: Viral conjunctivitis is caused by a virus, which can vary from a number of different viruses, like the common cold, different adenoviruses, etc. The most common viruses that can cause this type of pink eye are the adenovirus and herpesvirus. This type of pink eye can also occur in conjunction with a different sickness, such as an upper respiratory tract infection, cold, or sore throat. When you have viral conjunctivitis, you will most likely experience watery, itchy eyes. You may also notice that you are more sensitive to light. The symptoms can vary based on the virus that is causing the disease, and in some more severe cases of viral conjunctivitis, you may experience blisters on the skin or discharge from the infected eye(s). Bacterial Conjunctivitis: As the name implies, bacterial conjunctivitis is caused by different types of bacteria. These bacteria include Staphylococcus aureus, Streptococcus pneumoniae, Haemophilus influenzae, Moraxella catarrhalis, or, less commonly, Chlamydia trachomatis and Neisseria gonorrhoeae. Similar to viral conjunctivitis, this type of pink eye is also fairly contagious, although it is less contagious than viral conjunctivitis. Given the continuing development of children’s immune systems, this type of pink eye is more common in kids than adults. With bacterial conjunctivitis, you may notice the development of a sticky, yellow or green-yellow colored discharge coming from the corner of the affected eye(s). 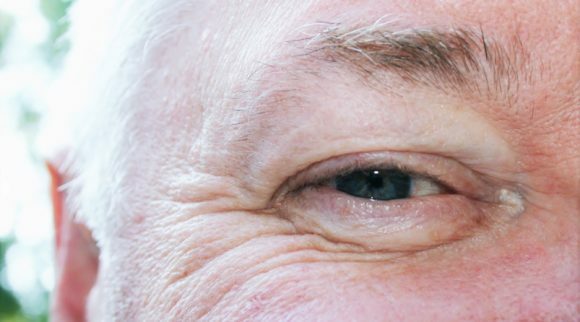 If this discharge continues to develop, it can become severe enough where it causes the eyelids to be stuck together, particularly worse when you are waking up. 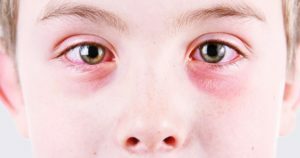 Given the bacterial cause of this type of pink eye, it can accompany other symptoms, including fever or behavioral changes, particularly in children, and will require medical treatment. Allergic Conjunctivitis/ Conjunctivitis caused by Irritants: Both of these types of conjunctivitis are caused as a result of the body’s reaction to an allergen, including pollen from trees, other plants or grasses, dust, pet dander, medicines, or any other allergen. It can also be caused by an irritant, such as foreign bodies or direct contact with smoke, dust, chemicals, or other irritants. Because there is no bacterial or viral cause for both of these types of pink eye, they are not contagious. So, how long is allergy-induced pink eye contagious for? No time at all! 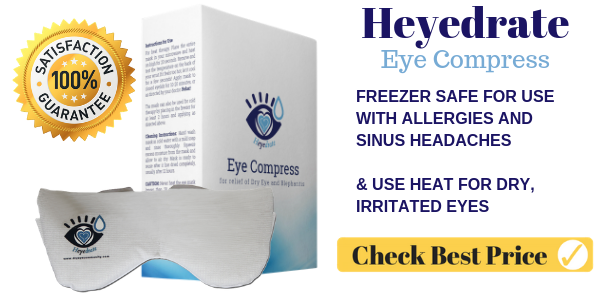 People with other allergic conditions, such as hay fever, asthma, and eczema, are more susceptible to developing allergic conjunctivitis, and these symptoms typically occur seasonally, when the presence of various allergens is high. Depending on the causal allergen, it might even occur year-round. This type of conjunctivitis usually has a clinical manifestation of watery, burning, and itchy eyes. This symptom is often accompanied with nasal congestion, runny nose, scratchy throat, sneezing, and increased sensitivity to light. Both eyes are affected. Conjunctivitis caused by irritants leads to the development of watery, red, and itchy eyes and tearing. Depending on the irritant and the contact that causes this type of pink eye, symptoms can vary in severity. It can also occur when contact lenses are worn longer than what is recommended or when they are not cleaned properly. A medical professional will diagnose conjunctivitis and determine the type of conjunctivitis using a comprehensive evaluation of a patient’s symptoms, previous medical history, and a physical examination of the patient’s eye(s). Because symptoms vary, as previously discussed, based on the type of conjunctivitis, a medical professional will use the symptomatology to assist in their diagnostic process. 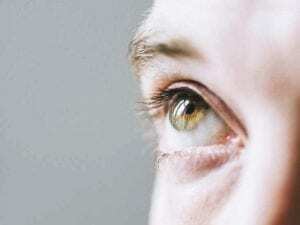 Even so, there are some universal symptoms, including eye redness and swelling, and so this can make it difficult in certain cases to make a firm diagnosis. The type of pink you have will determine if your pink eye is contagious or not. In some cases, laboratory testing may be necessary, such as in cases where there is discharge coming from your eyes. Your healthcare provider may ask for a sample of this discharge, which will be sent to the laboratory to help determine the source of infection and determine the type of conjunctivitis. How are each of the different types of conjunctivitis diagnosed? The universal eye inflammation and irritation is usually accompanied with symptoms of a common cold or respiratory tract infection in cases of viral conjunctivitis. In cases where there is discharge, the discharge is usually watery and clear in nature, rather than thick. In cases of bacterial conjunctivitis, it may occur on top of another infection, such as otitis media, an ear infection. In terms of symptoms, the discharge is usually thicker in nature and may have a colored hue. In cases of allergic conjunctivitis, it can be diagnosed easily if previous allergens are known. It usually occurs seasonally when various allergens are present and occurs with other signs of different allergic diseases. Symptomatology may manifest when a patient’s eye(s) itch intensely. 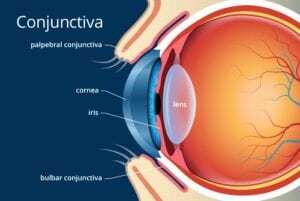 So, now that we have a better understanding of the minor differences between the different types of conjunctivitis, do they differ in how long symptoms last, how contagious it is, and how they are treated? The short answer is yes. In most cases of viral conjunctivitis, the symptoms will run their course over a few days, up to one or two weeks, but will resolve on their own without any medical treatment. Most cases of viral conjunctivitis are mild and might not require medical treatment. However, there are more severe cases that may require antiviral medications, such as in cases that are caused by herpes simplex virus or varicella-zoster virus. Because the cause is viral, antibiotics will not improve or treat viral conjunctivitis. An at-home remedy and treatment that you can use is to place a wet washcloth over your eyes. This will help treat inflammation and reduce irritation. When it comes to the question is pink eye contagious? Viral conjunctivitis is the most contagious type of conjunctivitis, so please do not share this washcloth with other people. This type of conjunctivitis can also be spread from coughing or sneezing. In cases of bacterial conjunctivitis, the symptoms can last a longer time than viral conjunctivitis and will require an antibiotic to help expedite recovery and reduce the spread to others. In most cases, this antibiotic will be in form of eye drops or topical ointment. However, similarly to viral conjunctivitis, the need for an antibiotic will depend on the severity of the symptoms. In more mild cases, symptoms will resolve within a few days without treatment and without subsequent complications. However, if you notice that you have discharge or already have a suppressed or compromised immune system, you may require antibiotics. A medical professional may also prescribe antibiotics if they suspect certain bacteria. Similar to viral conjunctivitis, bacterial conjunctivitis is also contagious and can be transmitted when you come into direct contact with anything that has been touched by an affected individual’s eye. Allergic conjunctivitis-related symptoms will improve by simply identifying and removing the potential allergen from your environment. Various eye drops and allergy medications can help treat and relieve symptoms. Based on your individual response to different allergens, you may be prescribed multiple medications to help treat not only the conjunctivitis symptoms, but other symptoms that are associated with the allergen(s). Removing the causal irritant will treat conjunctivitis caused by irritants, but eye drops may help provide relief from the resulting irritation and inflammation. Both of these types of pink eye are not contagious. Although conjunctivitis is not a serious disease and usually does not lead to any long-term complications, in certain cases bacterial conjunctivitis that goes untreated can lead to very serious and debilitating eye problems, such as a corneal ulcer. In rare but serious cases, it can lead to potential permanent vision loss. Although the universal symptomatology within the different types of conjunctivitis is red, swollen, or irritated eyes, do not assume that this automatically means you have conjunctivitis. These symptoms can also be caused by other eye-related conditions, including a stye, chalazion, or blepharitis. We will briefly discuss what these conditions are, so you have a better understanding of how they are similar and also different from conjunctivitis. What is a stye? It is also known as a sty or hordeolum. It is a localized infection in the eyelid that results in the development of a tender, red bump near the edge of the eyelid. 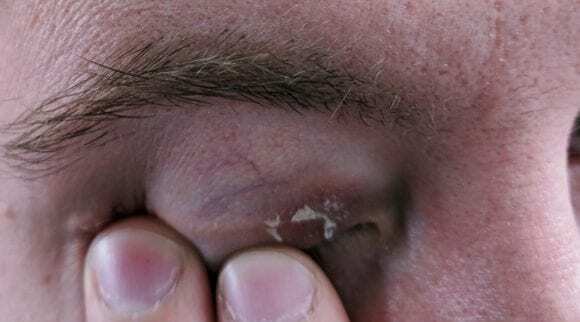 It usually occurs from a bacterial infection and can occur at two locations: the base of an eyelash, called an external hordeolum, or within one of the oil glands within the eyelid, called an internal hordeolum. 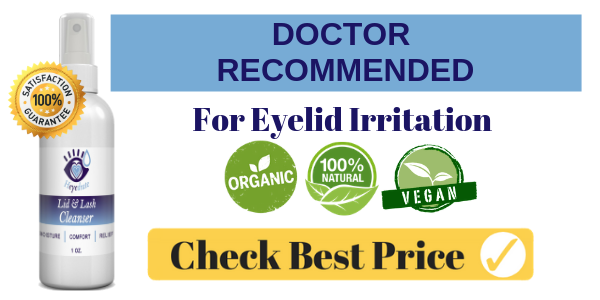 Some facts about eye styes are that the first symptoms are usually pain, redness, swelling, and tenderness, which can also occur in conjunctivitis. However, this does not lead to any vision changes or problems. While some forms of pink eye are contagious, the bacteria from a stye can be spread person to person as well. Then, what is a chalazion? Interestingly, these result from healed internal styes. At this point, when they have become chalazia, they are no longer infectious. Once they have developed to this stage, chalazia can contain pus and other blocked fatty secretions that are normally used to help lubricate the eye but are not able to properly drain out. Most chalazia drain on their own; however, they can grow large enough and may press on the cornea. In more severe cases where this can occur, it may result in blurry vision. 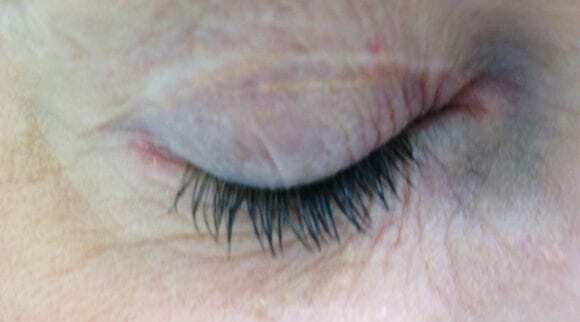 Blepharitis is inflammation of the eyelids. 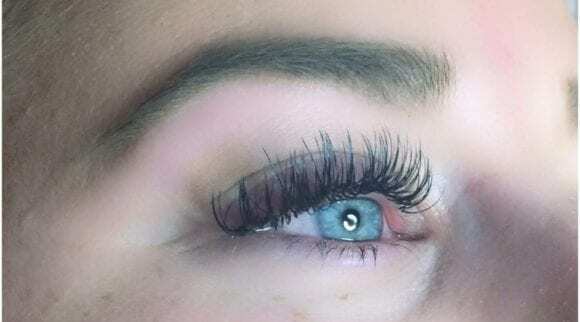 This inflammation is usually localized within the oil glands located near the base of the eyelashes, and it occurs once these glands become clogged. As with the previously discussed conditions, blepharitis can also result in watery, red, and irritated eyes. Similarly, there can be multiple causes of blepharitis, including various bacterial sources, allergies, or other potential irritants. With all of the symptomatology and risks of different types of conjunctivitis, how can you help protect yourself and your loved ones from getting conjunctivitis? As mentioned previously, both viral and bacterial conjunctivitis are extremely contagious. They are usually spread from close personal contact, such as touching or shaking hands. Viral conjunctivitis can also be spread through the air when one coughs or sneezes. Similarly, if you touch an object or surface with germs on it and subsequently touch your eyes, you may also develop conjunctivitis. Pink eye is contagious for as long as symptoms are present. Because of this, here are some simple tips that you can use to help yourself from getting conjunctivitis, or if you have it, from spreading it to those around you. Ensure that you always wash your hands frequently with both soap and warm water for at least 20 seconds each time you wash them. If you have conjunctivitis, remember to wash them especially well before and after cleaning and whenever you apply eye drops or ointment to the affected eyes. If there is ever an instance when soap is not available, use an alcohol-based hand sanitizer or similar hand disinfectant. This is the same whether you are diagnosed with conjunctivitis or are around someone who has it. Avoid touching or rubbing your eyes. If only one eye is affected, this can worsen the severity of symptoms in that eye and can also spread it to the other eye. If you are experiencing any discharge from your eyes, ensure that you wash the discharge using a clean washcloth. Wash these washcloths using hot water and detergent, and make sure to wash your hands again after you have used the washcloth. Do not share this washcloth with any others, as it can spread the disease. 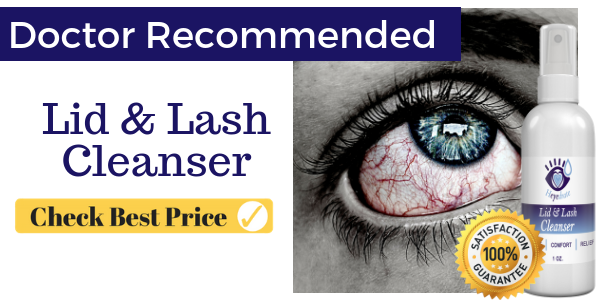 Better yet, try out the Heyedrate Lid and Lash Cleanser, which you should use twice per day to maintain clean eyelids and avoid conjunctivitis issues in the future. If only one eye is affected, do not use the same eye drop dispenser for your non-affected eye. Ensure that you are using two different bottles in this instance. Wash pillowcases, washcloths, towels, sheets, or any other surfaces that come into contact with affected eye(s) using hot water and detergent. Wash your hands after handling any items that have come into contact with affected eye(s). Do not share any of these personal items with others. If you wear contact lenses, stop wearing them until you are cleared by your eye doctor. Be sure to follow any instructions they may provide on lens care, cleaning, storage, and replacement. If you are cleared to use your lenses but are concerned about what to do until symptoms are cleared and treated, consider switching to daily disposable contacts until treatment is finished. In cases where you switch to using glasses, be cautious of any items, including hand towels that might come into contact with your eyes and may be shared with other people. Do not use swimming pools, as the chemicals in pools can worsen symptoms and can be a medium through which the disease spreads. If you are cleared by your physician and no longer contagious and you choose to go swimming, wear swimming goggles. If you are around someone with conjunctivitis, avoid touching your eyes if you have not washed your hands. Do not share any items that have been used with someone who is affected. 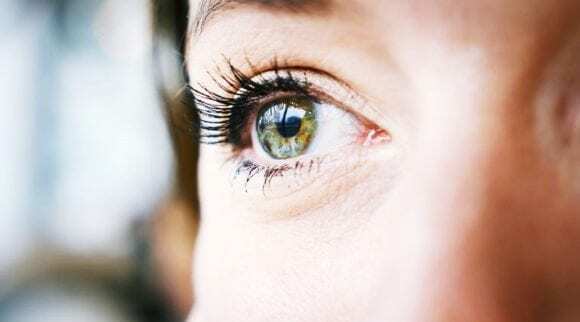 Although it might seem that pink eye is generally a condition that can resolve on its own, often without medical treatment, you might be wondering when you should seek out a healthcare professional. You should go to your optometrist or ophthalmologist if you experience any pain in your eyes, sensitivity to light or blurry vision that does not resolve or improve even when the discharge or tears are wiped from the eye(s). In addition, beware of increasing and extreme redness in your eye(s), symptoms that worsen in severity or do not improve even after treatment – antibiotics or other medications, or if you already have a weakened immune system from previous medical history, such as HIV infection, cancer treatment, or other medical conditions or treatments. Now you have a more comprehensive understanding of the different types of conjunctivitis, as well as is pink eye contagious and how long is pink eye contagious for? Still, you might have a few random questions. We’ve done our best to answer these below! Can I continue wearing my contacts? As previously mentioned in the prevention section of this article, you can continue wearing your contacts. However, this is not a universal rule. It depends on the level of irritation in your eyes, and if you notice that your symptoms are worsened whenever you do wear your contacts. If yes, stop using them immediately. Also, if you notice that any of the products you use to maintain, clean, and store your contacts seem to worsen symptoms, stop using your contacts immediately. Please seek the consultation of your eye doctor to ask if you can continue using your contacts and what options are available for you for treatment and transition to when you can use your contacts again. Now what about makeup? In most cases, it is recommended that you avoid using makeup until symptoms have improved and the conjunctivitis has been treated. Similarly, if you notice that certain makeup products seem to irritate your eyes or worsen symptoms, stop use immediately. If you have dealt with conjunctivitis, throw away and replace any makeup tools that you used while you were infected to prevent future infections and spread of disease. If I have suffered from pink eye, am I more likely to get it again? The short answer to this question is no, not necessarily. As discussed in this article, there are numerous causes of conjunctivitis, and they all differ slightly in their symptomatology and treatment. With this in mind, just because you have suffered from viral conjunctivitis previously doesn’t mean that you are more likely to get it again in the future. As with many medical conditions and diseases, prevention is the best methodology of tackling them. Ensure that you have good hygiene patterns and be wary if you are dealing with another medical condition where your immune system is compromised, you are at greater risk of developing any infection, including conjunctivitis. This is regardless of any previous history of conjunctivitis, as your body’s ability to fight off other infections is weakened. Also, be aware that pink eye is very contagious and so exercise caution and never touch your eyes without first washing your hands. As with any medical condition, please use this article as reference to inform yourself of the condition, but do not use it to self-diagnose. 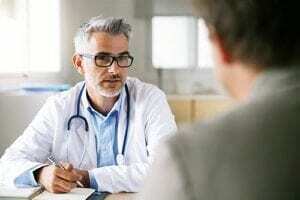 If you notice the symptoms discussed in this article but aren’t sure of what is going on, or if you notice that symptoms are getting progressively worse, arrange an appointment with your primary care provider immediately. You will need to be properly diagnosed from a healthcare professional to find the right treatment option. If you notice any acute visual changes and are concerned, go to the nearest emergency department. Conjunctivitis is not a life-threatening condition, but it can be inconvenient and annoying to deal with.